Three Catholics, Fabianus Tibo, Dominggus Da Silva and Marinus Riwu from Indonesia are in the danger to be executed within the next days. According to informations obtained by the World Security Network Foundation, three Indonesian Catholics—Fabianus Tibo, Dominggus da Silva and Marinus Riwu—who were sentenced to death in dubious court proceedings due to their involvement in disturbances in 2000 where 200 deaths occurred are in the danger to be executed within the next days. The proceedings took place in violation of international standards. Clear evidence exists that Indonesian security forces picked out three Christians in order to detract from their own incompetence. The Muslim ringleaders of the disturbance were not even charged. Pope Benedict XVI. and other prominent politicians from around the world have spoken out against the execution. Up to now, all appeals for clemency have been almost ignored by the Indonesian government and obtained only a stay of the execution, not the reopening of firal. The execution of these Christians, who are serving as pawns of the military, is an insult to thousands people, the USA, and the nations of Europe who supported Indonesia in its hour of need, providing hundreds of millions of dollars in assistance to victims of the 2004 tsunami. Then, no one said, "What faith are you? You’re not a Christian? Then I won’t help you!" In the Muslim province of Ace in particular, unselfish Christians from America and Europe aided the Muslim population. At the request of Rome, the World Security Network Foundation has joined the international campaign in the form of an open letter to the President of the Republic of Indonesia and the Chief of Staff of the Armed Forces for a humane and wise solution, so that we move away from a global "clash of civilisations" toward a safer world of tolerance and cooperation between Christians and Muslims. 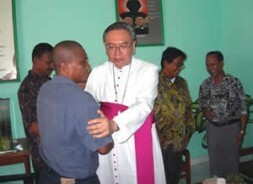 The Indonesian Bishop of Manado Mr. Suwatan greets the three convicted Catholics. 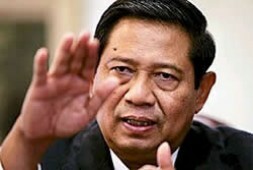 In an open letter to the President of the Republic of Indonesia and the Chief of Staff of the Armed Forces, we have expressed our outrage regarding this step, which is a slap in the face to the helpers and friends of Indonesia. This step adds fuel to the fire and only serves to strengthen the forces of radical Islamists, who are being handled with kid gloves. Call upon your congressional representative, senators, the Indonesian ambassador and government officials to join the Pope’s appeal for clemency today! "We are shocked to hear that you support the execution within the next days of the three Catholics Fabianus Tibo, Dominggus da Silva and Marinus Riwu!, President Susilo Bambang Yudhoyono!" Inform the media, who should begin reporting on events now! Please send a copy of your correspondence—preferrably scanned and e-mailed—to Dr. Cesare Zucconi, who will convey the appeal on behalf of those awaiting execution! Thank you very much for your personal involvement. "Networking a Safer World!" Christian Member of Parliament Nayla Moawad: "Lebanese women can participate in political life"